On the one hand, the school rules seem a bit extreme, allowing no outside food. I say this because I’m used to providing outside food for my child. The practice has been one of the easiest ways for me to keep her safe in a world where food can be lethal. I wish some of the people calling out the absurdity of the policy and wondering why everyone has to suffer for the right of one person could spend a day in the place of a parent with a food allergy. When my daughter was younger, we had to avoid three groups of allergens. Now, we are down to peanuts and tree nuts. My trips to the grocery store are longer. With produce, I have to consider where and how nuts are stored and if they are likely to contaminate produce one typically doesn’t peel. I have to read the ingredient lists carefully and decide whether the brand is trustworthy in their description of “processed in a shared facility using good manufacturing practices.” I wonder what their cart would look like if they did their normal shopping and then at the checkout line were asked to sort out products that cause an anaphylactic reaction. Maybe, just maybe, if everyone did that, I wouldn’t be subjected to moans and groans when the flight attendant announces “This will be a peanut free flight” or the hateful looks from another parent when I ask if their child could please keep their peanut butter sandwich on the picnic table rather than smearing the contents all over the slide at the playground. Maybe more people would offer financial support to researching why food allergies are on the rise and what can be done to halt this epidemic. Maybe we could all enjoy a world where food doesn’t kill. If you wish to make a change, consider a donation to Food Allergy Research and Education (FARE). Wouldn’t it be nice if no child were suspended for a sandwich? And nicer still if no one died from one? End rant. Stepping off my soap box. Some time back, a friend asked if I could recommend some books for a seven-year old boy. I’m asked variations on this somewhat frequently so I finally decided to sit down and write out a list. For this post, I’ll focus on series. I’m sure there will be more to come and these recommendations are in no particular order. Most will appeal to both boys and girls, but not every child will enjoy each series below equally. 1. The Magic Tree House series by Mary Pope Osborne – I have yet to meet a child who rejected this series in its entirety. There are nearly 50 books in the series so it can keep readers busy for a while. Jack and Annie are siblings who find a magic tree house in the woods near their house. The characters open a book they find in the house, say “I wish we could go there,” and are transported to the desired location. Before they can go home, they have to solve a puzzle and help either a person or animal. I like the message behind these books, even if as an adult reader, the writing style is a bit repetitive. For kids just beginning with chapter books, the series offers mild thrills and the chance to learn about the structure of narrative – without even realizing it. 2. 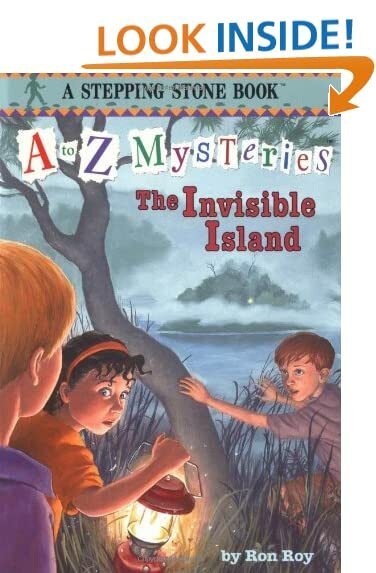 A to Z Mysteries by Ron Roy – Three relatable kids, Josh, Dink and Ruth Rose solve mysteries in and around the town of Green Lawn. My daughter and I loved the friendship presented in the books. Sometimes the kids get mad with each other, but they find ways to resolve their differences in a peaceful way. There are enough clues to help readers solve the mystery. Each book comes with a map and readers can use that to help solve the mystery too. It’s nice to see map skills in use. Also, I like the way the three kids teach each other. If one uses a harder vocabulary word, or casually mentions a tougher physics or natural world concept, a second character will be a bit confused so the first speaker explains him or herself, or they will talk about what they learned in school and compare notes on what they each remembered. Ron Roy has two other series – Calendar Mysteries geared toward the same age range and Capital Mysteries geared toward more confident readers. 3. Geronimo Stilton and Thea Stilton – These rodents both know how to spin a good yarn and get human kids excited about geography, science and the newspaper industry. Heavy illustrations support the text, giving it the feel of a graphic novel, but these are chapter books. My daughter prefers the Thea Sisters series, but the Geronimo Stilton is equally good, if not better. Also, there are a lot of bad puns and literally cheesy dialogue. The phrases “Moldy mozzarella” and “Fabumous” have become household favorites. 4. 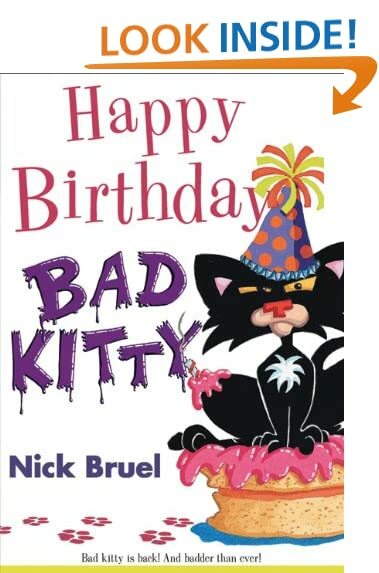 Bad Kitty Series by Nick Bruel – For earlier readers, pick up wacky alphabet book Bad Kitty which runs through the alphabet four times and serves as an origin story for our anti-heroine. I love the series for featuring a not so lovable feline who gets her comeuppance in a humours way. Again, there is a bit of a graphic novel feel, and the heavy illustrations make this a good step into chapter books. The author “breaks the wall” so to speak, inviting the reader to become the anonymous narrator who talks to Bad Kitty. Also clever, asides by Uncle Murray to explain more advanced concepts and the glossary. Some readers may be put off by the “bad” language. Uncle Murray often refers to “that stupid cat” but the reader is asked to laugh along with and at the bad examples they see on the page. Bad Kitty for President is one of the best explanation of politics I’ve seen. I’ll stop here for now. What series or individual books do you recommend? My daughter is always looking for new reads and my son is a few years away from needing some other suggestions. First, I let loose on Clifford, now I’m going to trash another icon of Children’s literature – the Bear Family. Created by the dearly deceased Stan & Jan Berenstain, the Bear Family series, better known as the Berenstain Bears, occupies four sections of prime shelf space in my local library. They are the first books the kids see when they enter the library, being just inside the door and inticingly at eye level for a four-year old. They frequently leave the shelf and come home in my library bag, much to my chagrin. The best of the books focus on a specific childhood experience. Every child preparing to move should have a copy of the Berenstain Bears’ Moving Day. I also give high marks to the easy reader series that includes The Road Race, The A Book and one of my all time favorite children’s books – The B Book. Seriously – if you haven’t seen that one, get it and read it aloud, even if you have to borrow a child. These are the few non-preachy books as well. It’s the rest of the books that make me almost as cranky as Mama Bear. You know Mama Bear, frequently introduced as happy, friendly, cheerful Mama Bear, at least until you turn the page and she’s frowning, nagging and ready to throttle one of the cubs. Oops. I’m sorry. Mama Bear would never resort to violence. She’s far too passive aggressive for that, which is why we need Papa Bear. Papa Bear has two distinct moods – terrifyingly angry and buffoon. When angry, he screams, pounds on furniture and throws one heck of a tantrum. That the cubs are inclined towards melodramatic fits should come as no surprise to anyone who has heard the adage “children learn by example.” The rest of the time, he’s an idiot. He needs the cubs and Mama to show him the error of his ways, whether it comes to recycling, eating healthy or treating others in a thoughtful manner. By the end of the book, he’s realized his mistake and vows to make a change for the better. inevitably, for each good habit he picks up, he develops three new ones, hence the proliferation of Berenstain Bear books. The Berenstain Bear books seem to be as much about how parents should behave as kids. And more often than not, the parents display poor decision-making and a lack of thoughtfulness. No wonder the kids are in trouble so much. Since September, I’ve volunteered bi-weekly in my daughter’s second grade class. Seeing the inner workings of her class room brightens my day. Her teacher is wonderful, friendly and fun, but firm. She leads the class with confidence. Over the course of the year, I’ve seen the children blossom under her guidance. Ms Turner knows how to bring out the best in each child and I’m grateful my daughter has been part of her class. But one thing still mystifies me. What do those children do to those pencils? After sharpening the pencils once early in the school year, I realized that is an easy task for me to start on when Ms. Turner is busy instructing the class. It is a tedious task, but I don’t mind it since the school has an electric pencil sharpener. I’ve watched the pencils dwindle in number, even discarding a few myself as the stubs became too short to feed to the whirring blades of the sharpener. It pleases me that the children use them so much. I see them scribbling away in notebooks or working on math pages when I visit, but sharpening the pencils reminds me how much work they do as they learn. But evidence of tooth marks tell me they sometimes suffer anxiety. By now, most pencils feature multiple bite marks. I picture the children I’ve come to know putting the pencil in their mouth as they apply “strategies” to their science or math tests. Perhaps the kinetic learners need this gesture in order to get their thoughts in order, for others it’s nerves. Most worrisome of all are the pencils whose severely dented metal ends and lack of erasers indicate a number of parents will one day pay for braces. My daughter assures me she doesn’t chew on the metal, but she said nothing about chomping down on erasers. At least she cleared up one mystery for me. Last week she informed me the boys beside her bothered her by competing to see who could break a pencil first. Now I know why I discarded four jagged stubs today. How do they get so much done? Every day or week that goes by without my posting a new blog, my mailbox fills with announcements of a new blog post by one of the many people I follow. Several of my favorites find the humor in parenting and the surprising reality of being a stay at home mom. They hit home and make me smile. They also make me green with envy. How do these women find time to blog on a regular basis? Suburban Snapshots details Brenna’s unexpected parenthood journey. And it’s freakin’ hilarious. Most moms will probably wet their pants (a side effect of childbirth) the rest of you can simply enjoy learning how having a toddler is like being at a frat party. I am in awe that her parenting brain works well enough to be witty. I’m not sure what happened to my brain. I think it slunk off in shame during an endless game of Chutes and Ladders. When I read these bloggers in particular, I feel better about neglecting the housework. I’m inept at it anyway. As for the kids letting me have a chance to read, well, thank goodness for bloggers who know how to make a site look good. The kids love the pictures, but my 8 yr old thinks Amber should hire her to do the illustrations. I would love to blog about important stuff (see the half finished blogs on tunnel tolls and ultrasounds), or even the everyday stuff (Legos) and produce something on a more regular basis. But I don’t. I like my sleep, my TV and playing tapfish. My kids can play nicely on their own for hours, but once the computer comes out, they hang all over me, desperate and clingy. They are jealous of the laptop. Just as I am jealous of those parents who can write a book, or a blog or even just have clean floors. My hat off to those superheros among us. Oh – and if you know of anyone else I should add to my regularly scheduled blog reading list, let me know. I could use a few more ways to waste time.